will determine the shape of the design. 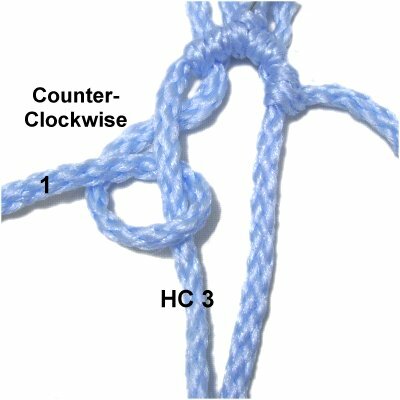 On this page are three examples of how this decorative knot can be used to make different shapes -- Horizontal Angles, Serpentine Design, and Eyelets. 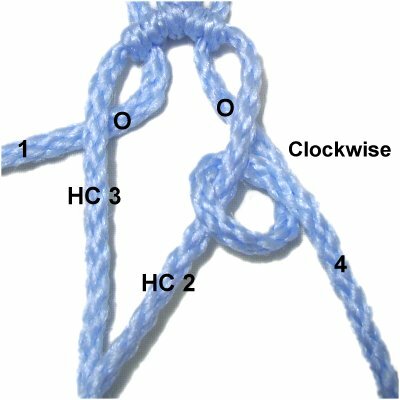 Click on the link or image to view the Daisy Design, which is just one of the many unique Double Half Hitch patterns you can make once you understand the basic concepts. 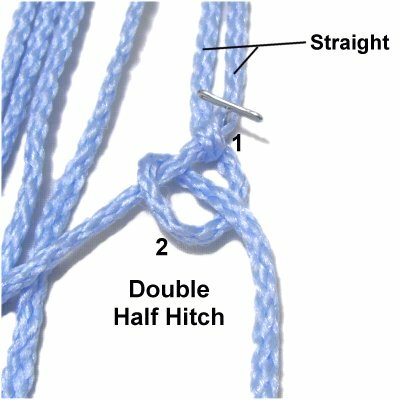 Make sure you know how to tie the Double Half Hitch in both directions. You should know the difference between a holding cord and a working cord. Click on the link or image to visit the page now. 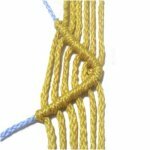 Double Half Hitch Patterns include designs where you tie horizontal rows that result in diagonal edges. This is a very common practice, especially in vintage Macrame projects. 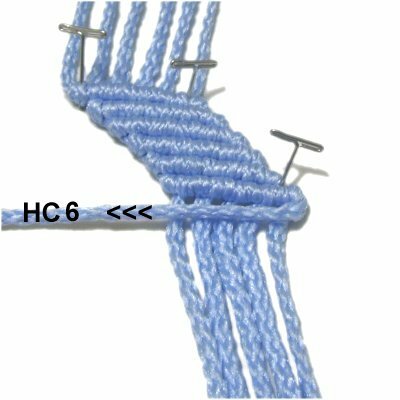 The instructions below will show you how to create the rows of DHH in both directions, forming the arrow shape shown above. Step 1: Secure at least six 36-inch cords vertically to your board. 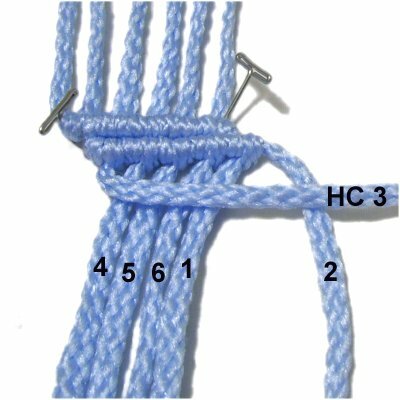 I recommend you use 4mm size material, since the knots will be neater. Mentally number the cords 1 - 6. Move cord 1 to the right, so it rests on top of the other cords. Secure it so it has tension and is horizontal. It will be the holding cord for the first row. Step 2: Attach cord 2 by passing it over - under the holding cord, in a counter-clockwise direction. As you pull it forward, it should pass over cord 2 to complete the loop. Tighten the knot firmly. The secured portion of the holding cord should be straight. Step 3: Tie another Half Hitch to the right of the first, making it a Double Half Hitch. 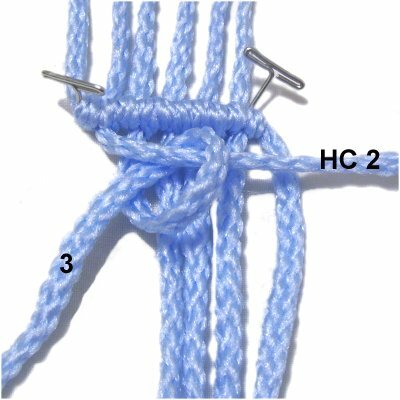 Make sure the first knot remains tight as you construct and tighten the second knot. Step 4: Repeat steps 2 - 3 with each of the remaining cords (3 - 6). Make sure you tighten the knots firmly and evenly, so the row looks neat. 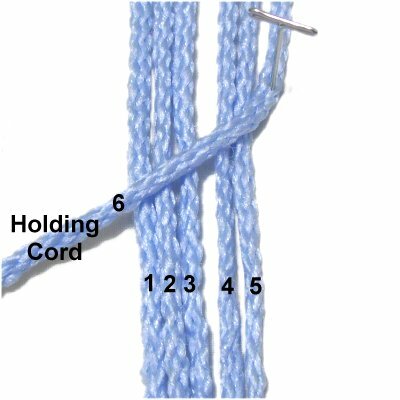 Bring cord 1 to the right of cord 6, arranged vertically. 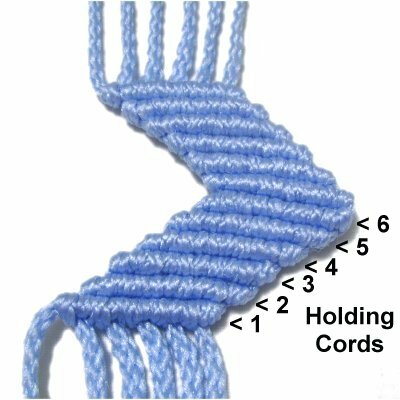 Designer's Tip: For many Double Half Hitch patterns, it's better to control the holding cord with one hand while tying the knots with the other. You will be able to adjust the tension and direction without relying on pins. See step 6 below. Step 5: Move cord 2 to the right, and use it as the next holding cord. 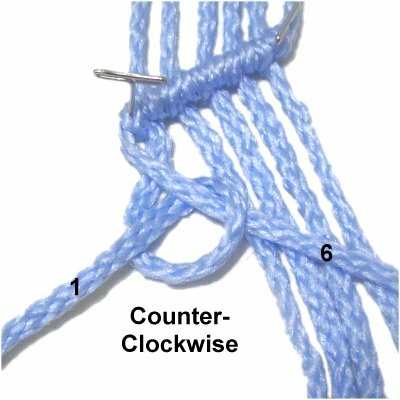 Make a counter-clockwise Half Hitch with cord 3, onto holding cord 2. Step 6: Pull holding cord 2 towards the previous row (right), using your right hand. 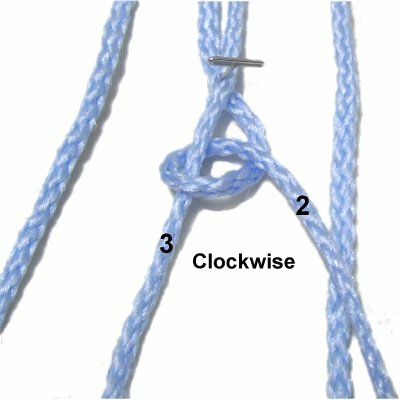 Tighten the Half Hitch with your left hand. 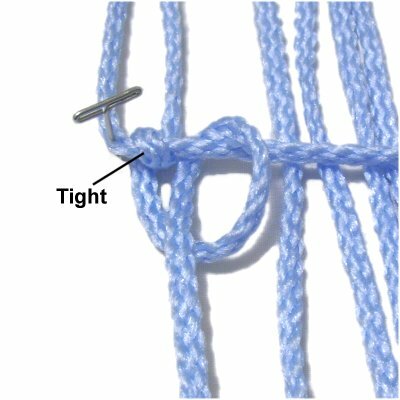 This method of tightening will bring the second row of knots closer to the first row. Step 7: Bring the holding cord back to it's original position, allowing it to relax slightly. Make sure the first Half Hitch doesn't loosen. 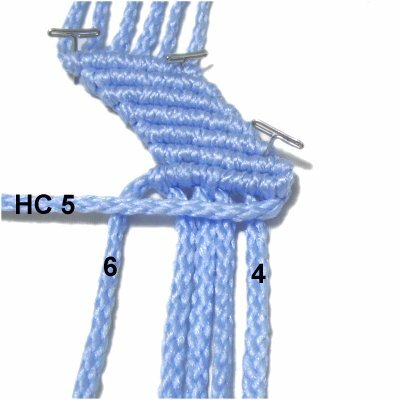 Tie the second Half Hitch to the right of the first, then tighten it as described in step 6. Attach cords 4 - 6, as well as cord 1, to holding cord 2. Always tighten as described above, so there is NO GAP between the two rows. Move cord 3 to the right, and use it as the next holding cord. Attach cords 4 - 6, and 1 - 2 to it with DHH. Repeat step 6 to tighten each Half Hitch. Step 8: Continue to repeat the same process, moving the next holding cord into position, then attaching all the others to it with DHH. The last three holding cords are 4, 5, and 6. Repeat step 6 each time you tighten the knots. Step 9: Move cord 6 to the LEFT, and use it as the next holding cord. Step 10: Attach cord 5 to holding cord 6 with a clockwise DHH. 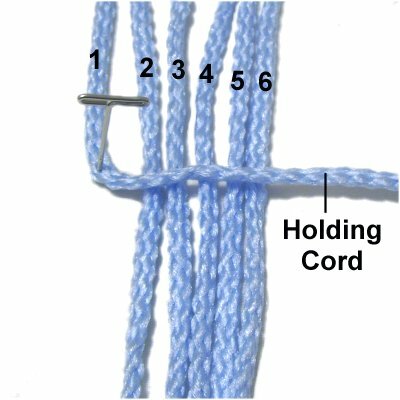 Pull the holding cord towards the previous row (left) with your left hand, while tightening the knot with your right hand. Do this with both knots. Step 10, continued: Attach cords 4 - 1 to holding cord 6 with clockwise DHH. 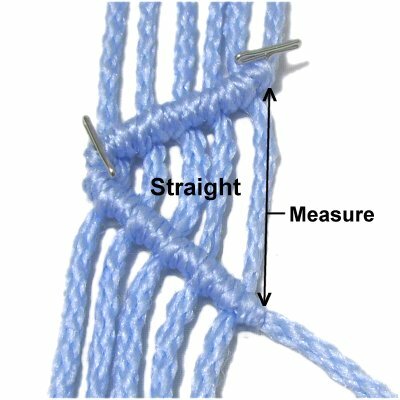 Tighten each knot as described above. Step 11: Move holding cord 5 into position (towards the left). Attach cords 4 - 1, as well as cord 6, with DHH. 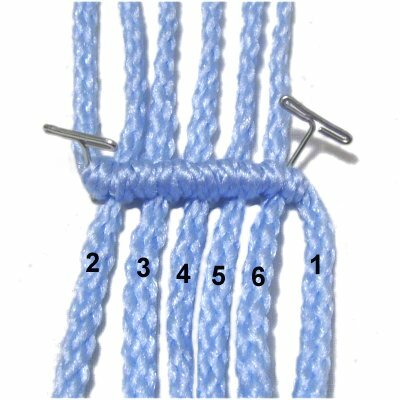 Tighten as described in step 10. Step 12: Repeat the same process to make the remaining rows. Always start by moving the next holding cord into position (cords 4 - 1). Then attach all the remaining cords to it. 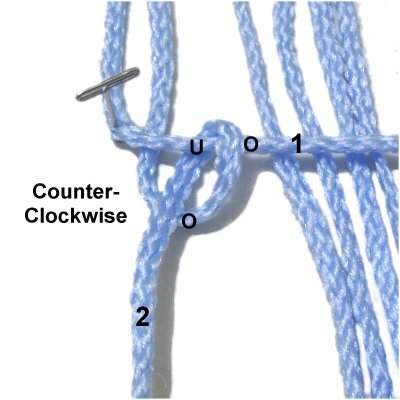 Remember that Double Half Hitch patterns are determined by the position of the holding cord. So in this Serpentine design, the holding cord simply alternates directions. You can make a variety of shapes, such as letters and numbers, using this technique. Step 1: You will need at least six 36-inch cords secured to a board vertically. Mentally number the cords 1 - 6. Move cord 6 to the left diagonally, and stretch it so there is tension. Place a pin where the cord bends. This will be the holding cord for the entire design. 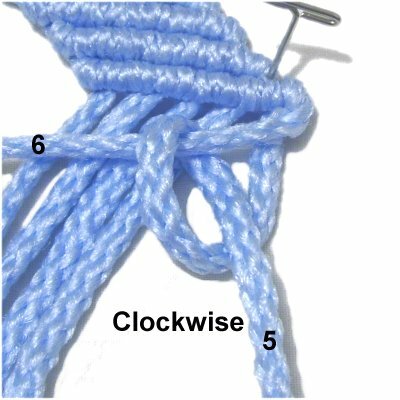 Step 2: Attach cord 5 to the holding cord with a clockwise Half Hitch, since you are moving right to left. Tighten it firmly and push it next to the pin. Step 3: Tie another Half Hitch with the same cord, placing it to the left of the first. Step 4: Repeat steps 2 - 3 with cords 4 - 1, in that order. Make sure all the knots are firmly tightened, so the row is neat. The secured portion should be straight. Step 5: Place a pin on the last DHH tied in the previous step, to secure and support the corner. 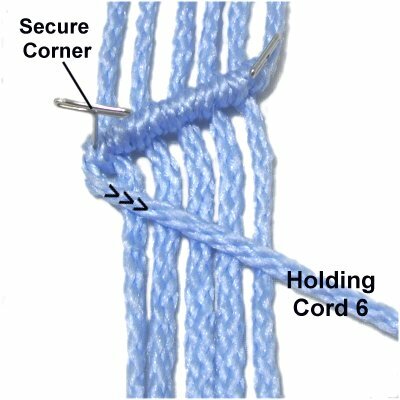 Move holding cord 6 to the right, and stretch it so it has tension. Try to mimic the diagonal slant of the first row. Step 6: Attach working cord 1 to holding cord 6 with a counter-clockwise DHH, since you are now moving left to right. 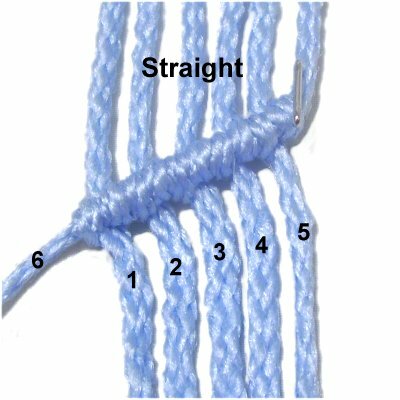 This image shows the first knot only. Make sure you tie two Half Hitches. Step 7: Attach cords 2 - 5 to the holding cord with DHH. Make sure each cord is straight as you tighten each knot. Push the knots close together to make the corner more rounded. 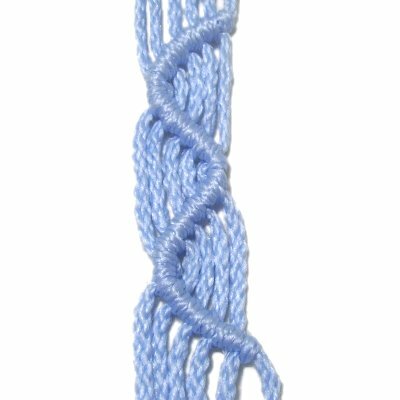 Designer's Tip: Double Half Hitch patterns should look the same from one area to the next. So you should MEASURE the distance between the two rows in the widest area (shown above). As you progress, you would then adjust the slant of the holding cord to match that measurement (shown below). Step 8: Move the holding cord back to the left. (This is where you would measure and adjust the slant). Attach cords 5 - 1 to it with DHH. 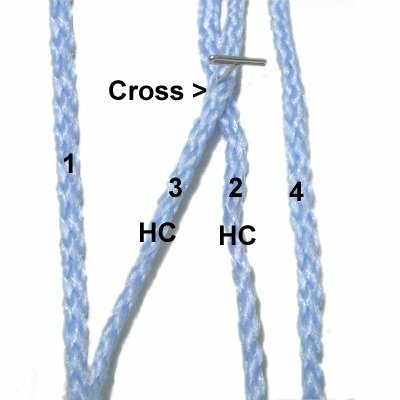 Most Double Half Hitch patterns look better if you repeat the design more than once. 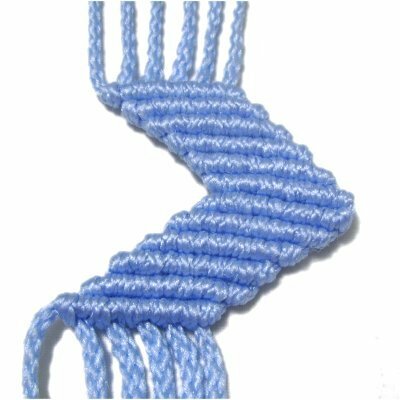 Double Half Hitch patterns include Eyelets, which are oval shaped designs made with very few cords. They are sometimes called "florets" in vintage Macrame books. They can be tied in a vertical row, as shown in the example below. 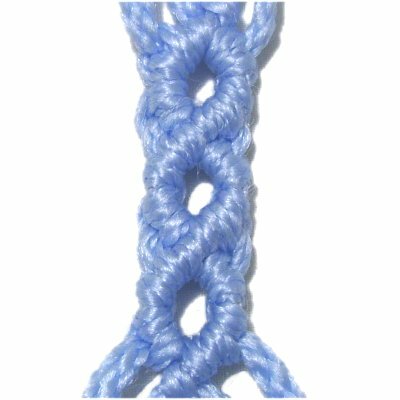 This form can be used as a bracelet or belt. 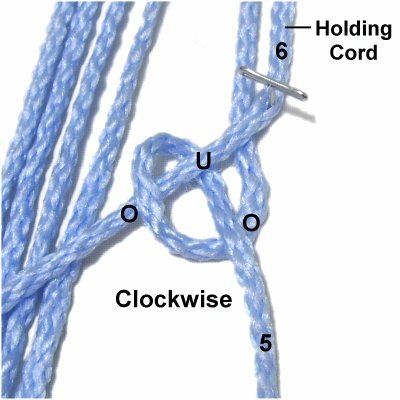 Handbag straps can also be made using this technique. You can also tie them in horizontal rows. 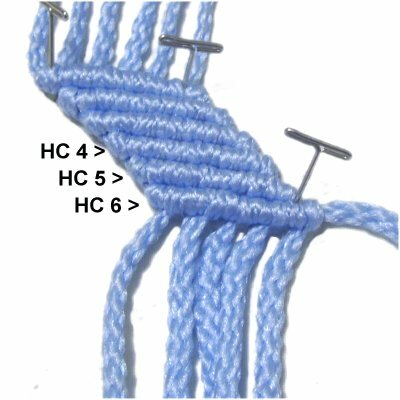 By alternating which cords are used to tie the Eyelets, you can create a panel. Step 1: Arrange four 36-inch cords on your board vertically, and mentally number them. Cross cord 3 over cord 2, and secure them. They are the holding cords for all the Eyelets you will make. Step 2: Attach cord 2 to holding cord 3 with a Double Half Hitch, rotating clockwise. 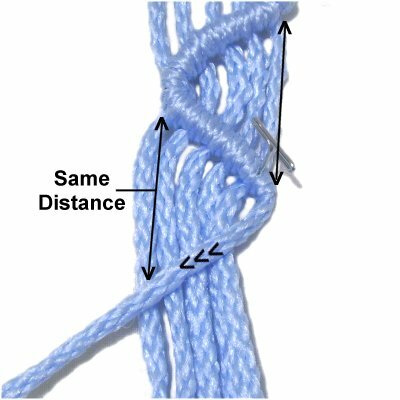 Slide the knot against the pin after tying both loops. Move cord 2 to the right, and cord 3 to the left. 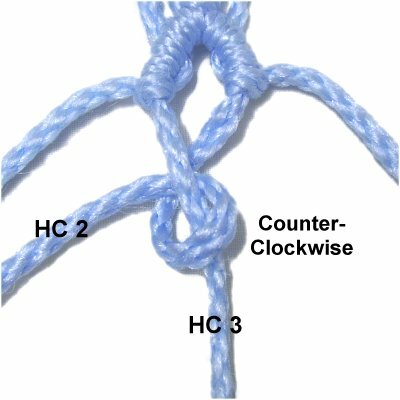 Designer's Tip: Double Half Hitch patterns often include other types of knots. 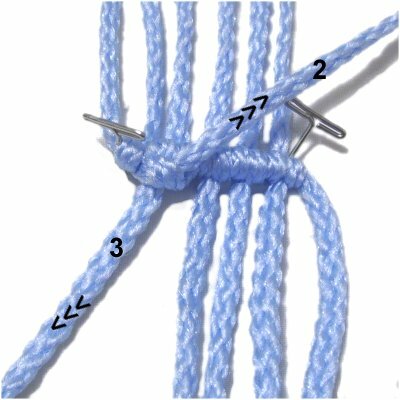 Step 2 is optional, if you have tied other knots just before making the Eyelet. Step 3: Attach cord 1 to holding cord 3 with a DHH, rotating clockwise. Attach cord 4 to holding cord 2 with a DHH, rotating counter-clockwise. Step 4: Move the holding cords towards each other, passing over cords 1 and 4. Curve cords 1 and 4 to the right and left. Attach cord 4 to holding cord 2 with a clockwise DHH. The cord should be heading right when you are done. Step 5: Attach cord 1 to holding cord 3 with a DHH, rotating counter-clockwise. The cord should be heading left when you are finished. Step 6: Close the Eyelet by attaching holding cord 2 to holding cord 3 with a counter-clockwise DHH. Step 7: Repeat steps 3 - 6 at least 2 more times, to make more Eyelets. 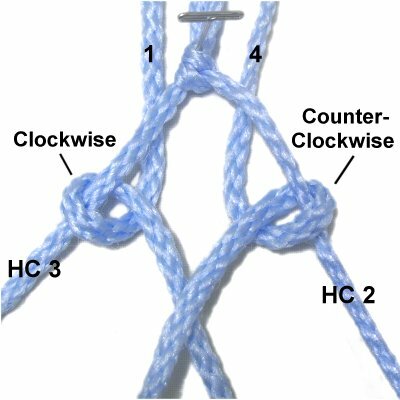 Have any comments about Double Half Hitch Patterns? Contact Me.